15-year-old 3-door "frozen refrigerator has broken" so check! ! This review is about item#47122747. I used it even while I was in the company until now, but I can use it with confidence. This review is about item#37651275. 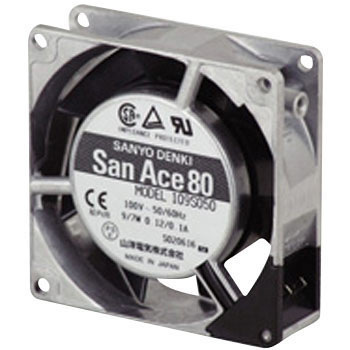 Sanyo electric fan 30 years ago broke, when purchasing the same thing with the outside diameter size, the mounting holes were exactly the same size, so it was easy to replace. I was worried because the height was short and it was changed, but it was completely replaceable without any problem. This review is about item#35102331. We installed two in a small home-made thermostat to move the air so as to eliminate temperature unevenness. I am satisfied with a model that is space-saving, static and free of trouble. Inventory varieties are plentiful and cheaper than electronic parts shops, we will continue to purchase. This review is about item#47122652. Reduce rotation speed, use rotational noise to AC FAN exchange. Reduce rotation speed, use rotational noise to AC FAN exchange. The target fans were immediately available. This review is about item#352932. Four mounting holes were not threaded, so bolts were needed. The previous mold was threaded. This review is about item#352957. I used it to replace the toilet fan. It was cheap and saved. I will also buy it. It is considerably cheaper than ordering genuine from a manufacturer. Because it is a part that often deforms or does not turn around due to oil adhesion, low prices are saved. I will also purchase it.